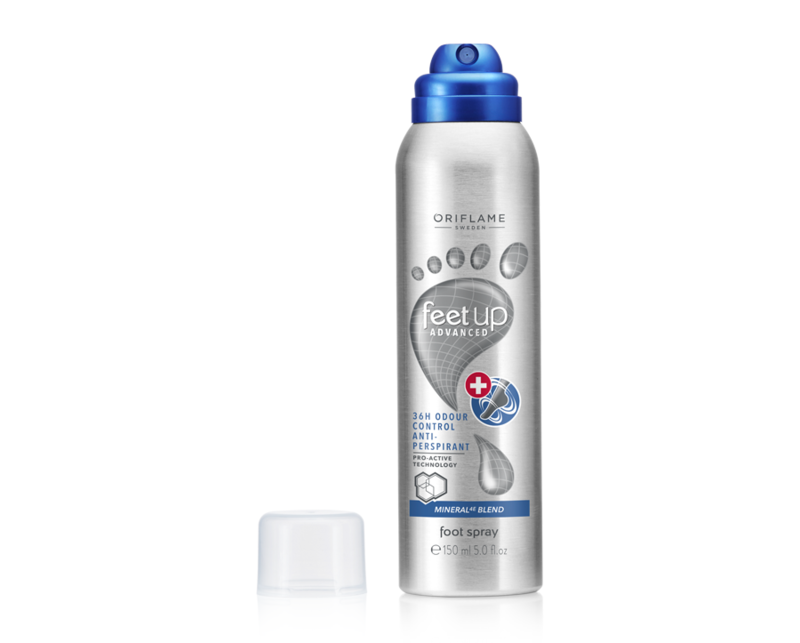 Oriflame’s range of high performance foot care is back and better than ever – with new products, new packaging, improved formulas and a magnificently soft new fragrance. Discover it, rediscover it and enjoy the results! Enter a world of beauty with Feet Up Advanced. Each product is formulated with natural extracts and oils to help keep your feet beautifully pampered and beautiful! Rough and cracked heels? If you have foot problems that keep you from having fun and displaying them with pride, and if common foot products do not help, you need Feet Up Advanced – care that meets specific needs, to make you feel envious. Repair & Smooth Feet Up Advanced Heated Cream . This rich and deeply soothing cream is formulated with Mineral4E Blend and a trio of intensive moisturizers – Urea, Cocoa Butter and Panthenol. Together, they help repair and protect dry, rough and cracked skin for visible improvement in just 3 days. Now with a new lid! How to use:Apply twice daily – morning and evening, ideally after the shower / bath. Foot massage, concentrating on the heels and dry areas. High Performance Cream with Urea, Cocoa Butter, Panthenol and Mineral4E Blend, to help repair and protect rough and cracked skin. Visible improvement in only 3 days (clinically tested – in vivo). Tested clinically and on the consumer. Soft fragrance. 75 ml. Instantly nourish dry and dehydrated feet with the Feet Up Advanced Intensive Moisturizing Feet Mask. This extremely rich cream is formulated with a high concentration of intensive moisturizers – Glycerin, Beeswax, Shea Butter and Mineral4E Blend. 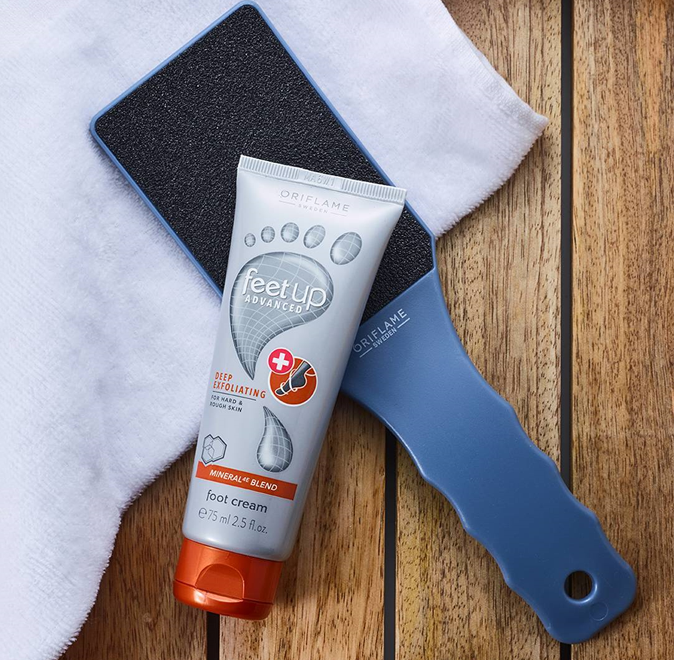 Together, they help repair dry feet, providing an instant boost of 85% hydration (clinically tested – instrumental test). How to use: Apply to clean and dry feet 2-3 times a week. Apply a generous layer to the feet and let it act for a minimum of 20 minutes. 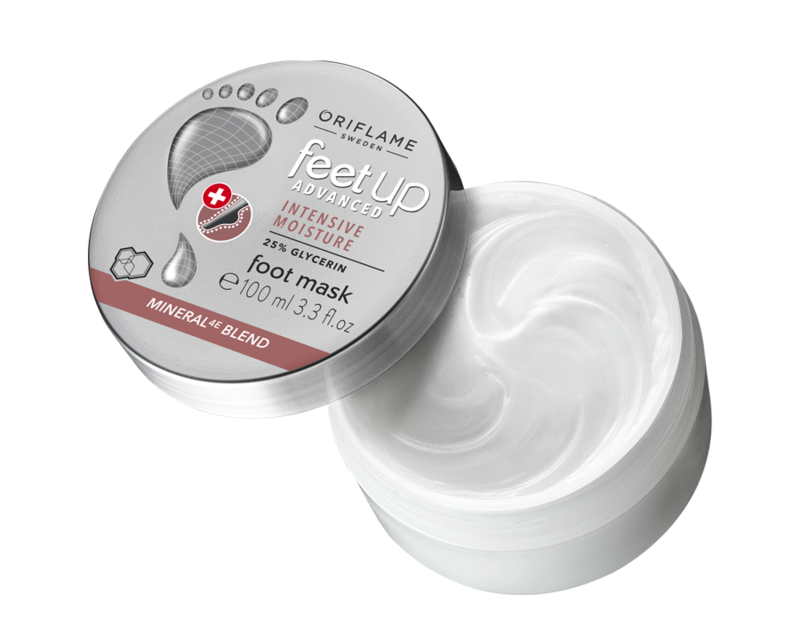 For best results, wear Oriflame Moisturizing Socks / Cotton Socks, after applying the mask and let it act all night. Remove socks and apply, by massaging, a moisturizing foot cream. High performance foot mask formulated with intensive moisturizers – Glycerin, Beeswax and Shea Butter – and Mineral4E Blend. Helps repair dry and dehydrated skin. Instant boost of 85% hydration *. Tested clinically and on the consumer. Soft fragrance. 100ml. Directions for use: Apply twice daily – morning and evening. 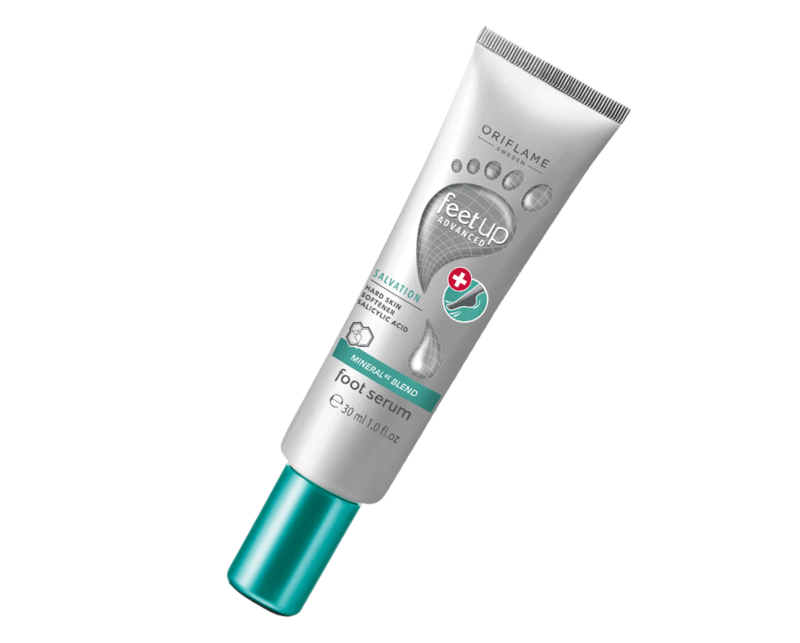 With the precision applicator, apply the product directly to areas with calluses (dry, hard areas, usually greyish / yellowish) and massage the product to aid absorption. Serum concentrate for dry and callused skin with Salicylic Acid, Mineral4E Blend and intensive moisturizers. It penetrates deep into the skin to soften the calluses, nourish and soften the skin. Impressive results after one week. Tested clinically and on the consumer. Soft fragrance. 30 ml. Highly effective formula, with naturally occurring pumice particles, Mineral4E Softening Blend and Moisturizing Shea Butter. Rich and creamy, high performance scrub with natural pumice particles, Mineral4E Blend and Nutritious Shea Butter. Remove with water. It effectively exfoliates and purifies dry and rough skin, leaving it smooth and smooth to perfection, with visible results soon after first use (tested by 69 people with dry and rough feet). Consumer Testing. Soft fragrance. 75 ml. FEELING OF TIRED AND HEAVY LEGS AND FEET? Relieves the feeling of heavy legs and tension. Relief of legs feeling heavy in 7 days. Helps minimize the appearance of varicose veins. Both men and women may experience the sensation of tired and heavy legs, however this sensation happens mainly when they spend a lot of time standing. 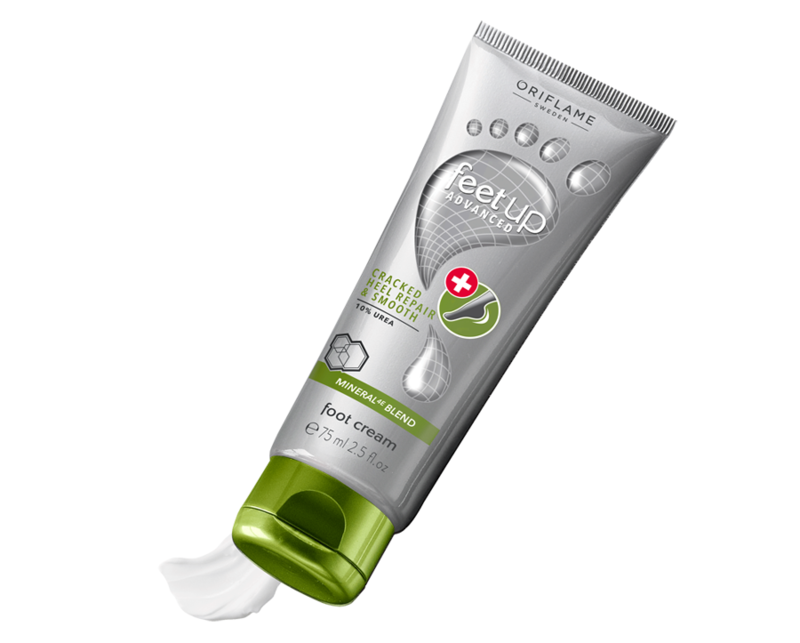 The Feet Up Advanced Soothing Gel and Foot Gel revitalizes and refreshes to relieve the feeling of heavy legs. How to use: Massage the product into the feet and legs twice a day. Massage firmly, in circular and ascending movements. Gel for Feet and Legs of high performance, with Technology Stimulating and Mineral4E Blend. Relieves the feeling of heavy and tired legs in 7 days (tested by 66 people with tired and heavy legs). Refreshing and soothing effect after application, which lasts. Rapid absorption. Consumer Testing. Gently scented. 150 ml. Directions for use: Apply to clean feet in the morning, or whenever needed. Vaporize on the feet, including between the toes. Suitable for use in shoes. deodorant spray of high effectiveness for feet. 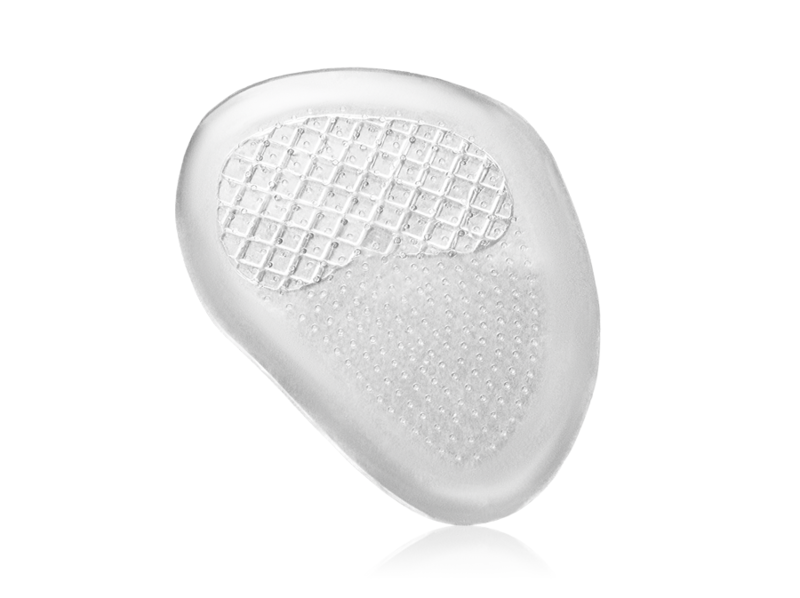 Helps control perspiration and hydration to prevent bad odors for 36 hours. With Pro-Active Technology and Mineral4E Blend. Quick drying formula. Tested clinically and on the consumer. 150 ml. This practical file gently exfoliates your feet, leaving them wonderfully soft. Use it after soaking your feet in warm water. Dimensions: 23 х 6.5 cm. Cushions Foot cushions to reduce pain and discomfort in feet on any type of shoe, boot or sandal. Transparent, washable, reusable. Unique size. Material: TPR. Dimensions: 9.4 x 6.5 cm.